X" marks the spot for style. 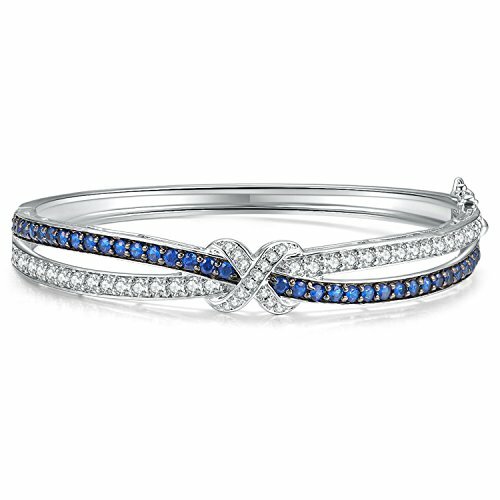 An exciting look any time, this eye-catching silver-tone bangle bracelet features white gold plated brass ribbons lined with glistening lab-created blue and white sapphires that meet in an "X"-shaped knot at the center. A lovely look with business or casual attire, this 7.25-inch circumference hinged bangle is polished to a brilliant shine and secures with a box clasp. The bracelet comes in a jewelry gift box. No wrapping needed. Perfect for gift giving. Great valentines day gifts for women, gifts for mom, gifts for mother in law, gifts for wife, gifts for daughter, gifts for aunt, gifts for best friend, etc. Ideal Valentine's Day Gift, Birthday Gifts, Anniversary Gifts, Christmas Gifts, Graduation Gifts, Mother's Day Gifts, etc, or just as a surprise to remind that special one how much you care! ♥Birthday or Holiday Gifts for Women♥ Come in an elegant jewelry gift box, perfect for any gift giving occasion, great jewelry gift for women - mom, wife girlfriend, daughter, sister or friends on Mother's Day, Birthday, Anniversary, etc. Treat yourself or someone special to this stunning bangle, 30-day money-back guarantee for any reason; 12-month warranty for quality-related issues.